You are here: HomenextPeoplenextPlayer ProfilesnextHudson, Brian "Baggy"
“Baggy” Hudson was a second row forward and occasional prop who played 185 games for Gloucester between 1951 and 1964. He played for Gloucestershire and was an England trialist. Brian A G “Baggy” Hudson was born in Stroud in 1933 and was educated at Marling School. He made his debut for Gloucester against Old Paulines on October 13 1951, but only really established himself as a first team regular in 1957-58 after several seasons playing for Gloucester United. The competition for second row places was fierce in the fifties and early sixties and Brian could never be certain of his first team place. However, he gradually gained a reputation as a hard and relentlessly competitive opponent. 1962-63 was a memorable year for the player described as “Gloucestershire’s fieriest second row forward”. Hudson was selected as reserve for the second England trial at Kingsholm in December but asked to be released to play for Gloucester at Neath. He became a regular first choice for Gloucestershire and played in a memorable County Championship semi-final against the all-conquering Warwickshire side at Kingsholm. As a result of his club and county performances he was named in a short list of 40 from which 23 were selected for England’s tour of New Zealand and Australia in May and June 1963. In 1963-64 he played for the Possibles against the Probables in the first England trial at Bedford, on 7 December. However the selection came late. He was generally felt to have lost some of his old fire and after playing in both of the South Western Group play-offs, against Somerset and against Cornwall, he was dropped by the county for the quarter finals. 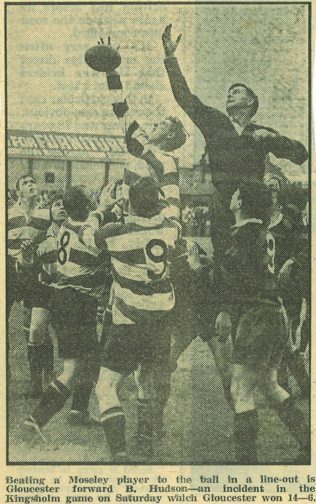 On February 19 1963 the Citizen sports page headline read “Gloucester bombshell: Brian Hudson dropped”. He lost his first team place for the rest of that season. The following year Hudson played a number of games in the front row, including a closely contested game with unbeaten Cardiff. He gained a recall to the county side at prop and played in the quarter final of the Championship at Kingsholm. He was in and out of the first team and decided to retire at the end of the 1964-65 season, when his first child was born. 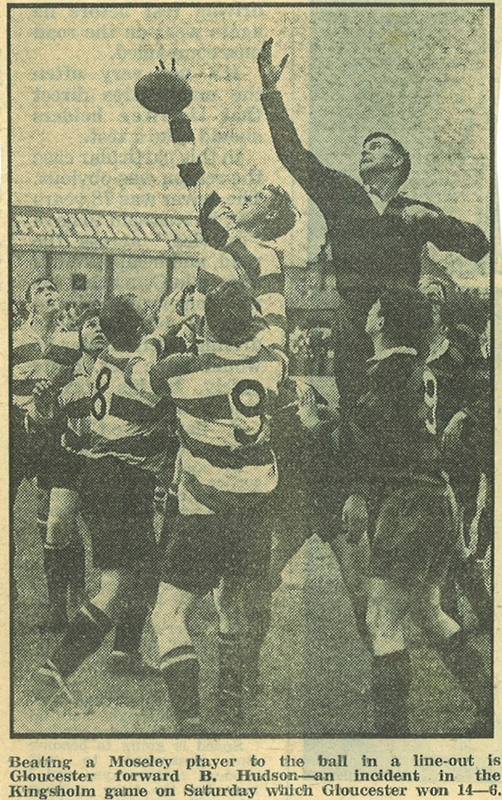 Michael Dineen best summed up Baggy Hudson’s contribution to Gloucester when he wrote in the Citizen in September 1965: And another gaping hole in the Gloucester pack is caused by the absence of a tough-egg of the calibre of Brian Hudson…… They used to say that Brian was the forward they’d most prefer to have in their company against a hard team.